Summer is upon us, at last! Well, it’s supposed to be, anyway. Given that this is the British climate things seem to be a little slow at the moment, with the occasional showers coming down from clouds overhead, but we’re at least feeling things heating up from a rather chilly spring. We imagine we’ll be seeing the sunshine soon enough, however, and that’s exactly why we’re excited to have the chance to provide our artificial grass for you in the time that it looks its best. For a sunny day underneath a clear blue sky, we’d certainly have to recommend our 30mm Lush Green artificial grass. It features three shades of vividly coloured green strands, paired with an additional four which curl and help replicate not just the look of real grass, but the authentic feel of it too. In particular, our Lush product faithfully recreates a slightly grown but well maintained lawn, though it won’t be growing or fading as its natural equivalent would. There’s barely any maintenance involved too, which you might find surprising when you see just how good this grass looks on a typical summer’s day. Just a brush or once-over with the hoover will remove surface residue and keep the grass’ fluffy and natural appearance going strong, with absolutely no weeding required, and what’s more our lawns are completely pet friendly, too, so your dogs, cats, and other furry friends won’t miss out on any of the fun. The perfect choice for some memorable moments in the sun, then! 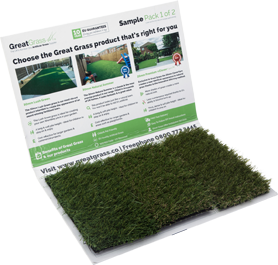 At Great Grass we are the largest artificial grass suppliers in the UK, providing a highly professional and experienced range of services at fantastic prices alongside a comprehensive wealth of knowledge when it comes to our chosen field. If you’re looking to really make your garden or outdoor space shine brightly in time for summer, make sure you get in contact as soon as you can; we’d love to hear from you, and with just a quick chat we can discuss how best to meet your every requirement or answer any questions you might have for us.